As an avid cat lover and missing both my cats from home while traveling to Japan for work, I couldn’t be more excited when I learned that there was a cat café near our hotel in Utsunomiya. 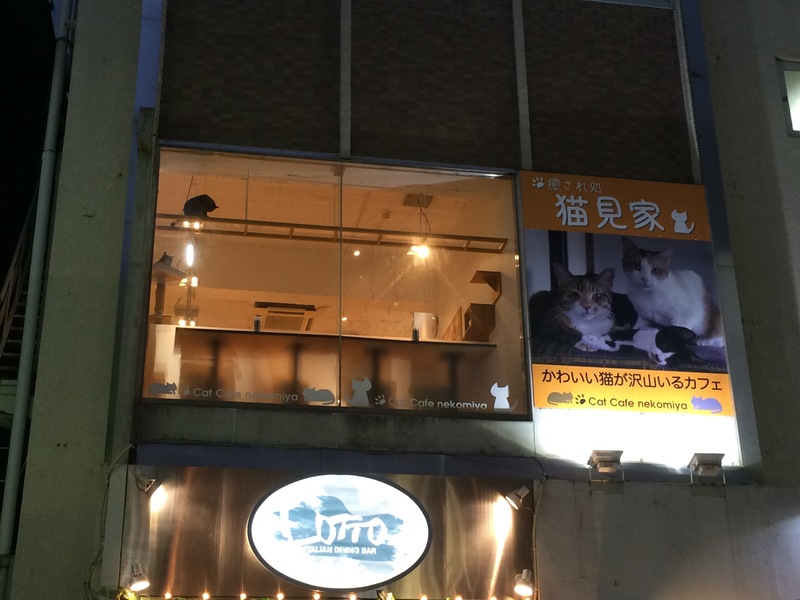 Just off of Orion Dori (a main shopping street), you can find Cat Café Nekomiya. It is on the second story and you can easily see it (and some cats!) from the outside. Going inside, you go up some stairs lined with cat photos until you reach the landing. Before heading inside you have to take off your shoes then get ready for some cat-tastic fun! Inside there were big fat adult cats along with adorable energetic kittens. In the small café there were about 10-15 cats given free reign. How it works is you pay for the amount of time you are there. The first time option was 30 minutes, then 10 minute increments from there. You don’t have to decide how long you’ll stay when you get there you pay when you leave. We were there for an hour and that only cost us 500 yen (~$5)! We started sitting at a table but didn’t stay there long. We ordered drinks then spent the entire time petting, chasing and playing with the cats! There are boxes of toys to play with, structures to climb and scratching posts to scratch. If you are hungry they also had cat themed meals and desserts. Although no one there spoke English, we were all able to easily communicate our love and excitement for the cats! This entry was posted in Asia, Japan, Utsunomiya and tagged Asia, Cat, Cat Cafe, Japan, Kitten, Orion Dort, Schmahl World, travel, Utsunomiya. Bookmark the permalink.